Walking back to the car after the funeral was again a very surreal experience. Family were catching up and chatting together and I was in my own little bubble. The girls were running around chasing each other giggling, sounds of life filled the air. I couldn’t look back, I couldn’t bear to see the hole in the ground holding my little boy, I didn’t want to know if there were people already filling in the hole, I’m not even sure how long it takes before they start to fill in the hole, but I didn’t want to risk seeing dirt piled on top of my little baby so I kept my eyes forward and didn’t look back. We told everyone that we would see them back at our house, got in the car with Alethea and drove off. She was in the back excitedly talking about her cousins and Ryan and I sat in the front with big wide eyes staring at the road not taking anything in. It was so cold that day, we got home and put our heating on and set it for 220C, Alethea was talking so fast, she wanted to get her lollies and chippies out and ready for her cousins to come, and she kept asking ‘when will they be here mummy, where are they?’ I told her that they needed to walk back to their car and then drive to our house so they would be here in a little while, to be patient and soon they would come. When her cousins did arrive they brought with them a bag full of trinkets for Alethea, Dora pens, colouring books, teddies, etc. they had also written her little cards saying that they were sorry she is upset and hope she feels better soon, so very sweet. Alethea squeals with delight at all the trinkets and then starts running around showing the girls all the lollies and then just running with excitement as she played with her cousins. As the rest of the people started to come in I stood at the kitchen bench ready to start making teas, coffees and drinks but as more came in I found myself pushed out of the kitchen, so I sat on the couch and watched as the family got food and drinks out for everyone. I sat on that couch the whole time everyone was there, half of me felt like I should get up and be a good hostess, and the other half told me that I could just sit and observe, my baby had just been buried, I didn’t want to do anything, I sat and stared as the family started with their stories and jokes and funny anecdotes, I was taking some of it in but generally just staring wanting the day to be over. I wanted just to cuddle up to my husband and block out the world, I didn’t want to pretend that everything was “ok” because it wasn’t, and I wanted everyone to leave me in peace. How was I meant to be concentrating on what they were saying, every thought that I had was on Liam, every second of the day he was there, he was in everything that I did “Liam, Liam, Liam….Liam’s death is not my fault” while the family happily laughed and joked I was sitting there trying to convince myself that I hadn’t killed my baby. As people started leaving my brother came, embraced me and whispered ‘you can call me whenever you want, even if it is just to have a cry on the phone to me, I will be there’ I think he could see how surreal the day felt for me and how much I wasn’t enjoying pretending that everything was ok. I did enjoy seeing Alethea have fun, I always enjoy seeing her have fun, but as for everyone else…I just couldn’t concentrate on them. We had Nanna take Alethea to daycare that afternoon, there was only a couple of hours left in the day but we figured that she would have a lot more fun running around with her little friends than staying home with us. Left alone Ryan and I had a cuddle and a cry on the lounge. It had been an exhausting emotional horrendous day and I didn’t feel my age, I felt much, much older, my body was heavy, my heart was heavy and I wanted to fall asleep and never wake up to feel the pain that I had. The phone rang later that afternoon and I guessed it was one of our parents, either mine or Ryan’s just ringing to let us know that they thought Liam’s service was beautiful, but we didn’t answer it. I had nothing to say to anyone, I had nothing to talk about, what can you talk about when your baby has just died and been buried, every thought that I had was on Liam and talking about trivial things seemed pointless. I didn’t care about things that normally get us upset like if it was too cold that washing couldn’t be dried, I didn’t care about what we were going to have for dinner, I cared for nothing but Liam, he was my every second, my every thought, from love he came to me and now he wasn’t here, I would never be able to think of anything else EVER again, I knew it to be true…. “Liam’s death is not my fault”. That night I burst into tears, and other than the obvious, Ryan asked me what was wrong, and I told him that all I could think about was how cold it was and how Liam was buried in a hole in the ground and it was freezing outside, yes I know he was dead, but as a mum I was upset because I thought he would be cold and alone and scared, and I wondered if we had dressed him warm enough, and whether he could feel the softness of the little blankie that we had given him…again yes I know he was dead, but as a mum these are things that you think of after your baby has died. I wanted another cuddle with him, I wanted to feel the softness of his skin against my lips, I wanted him out of the ground, alive and in his cot. Thursday came and we took Alethea with her scooter down to Manly to ride all the way along the footpath, even though we didn’t really feel like being out and about, it was easier to entertain Alethea that way, she was able to burn off a lot of energy while we just wandered slowly behind her, to stay at home with her meant we needed to be having tea parties and play Thomas train tracks with her and constantly entertain her, while we were out and about she was able to entertain herself, we just needed to keep up. While we were walking Gina called my mobile to ask if we would be home that day and I told her that we were just scootering down at Manly and would be back in an hour or so, she let me know that she had made more food for us and that she had left it at the front door in the shade for us. Lisa then called and asked if she could pop in that afternoon and sit and have a chat, which of course we said yes to. Many other friends also texted us and told us that they would pop in and have a chat but out of all those friends who said that, there were only a couple that did….I’m not sure why the rest didn’t turn up, maybe they thought that we didn’t want any company, but they just didn’t come. Truth be told we weren’t really up to lots of company, but it was nice when people stopped in just for 5-10mins to let us know that they were thinking of us and grieving with us. When Lisa came that afternoon, she knocked at the front door and as soon as she saw me tears filled her eyes, she apologised to me saying she didn’t mean to cry and upset us but she couldn’t help it, but it was beautiful and heartfelt to see that our friend was devastated for us, I told her that she wasn’t upsetting us by crying and that if I cried, I was crying because my baby was dead not because of anything she said. (From what I can gather, people often feel like they need to say something profound when your baby dies, but they can’t find the words that they want to say so they say nothing at all, or they feel that they need to be strong and not cry so as not to upset you so they either avoid the conversation altogether and talk about something random or they avoid you altogether so they don’t upset you, trust me, if you can’t think of something to say, a simple ‘I’m sorry for your loss’ and/or crying with someone who has lost their baby is beautiful, it makes us realise that you acknowledge our baby, that you think it is unfair and that you are grieving with us.) I proudly showed Lisa some of the photos we had, from the photos that Ryan took of Liam when he was alive and fighting for life in the OT to the photos that Ryan and I had of us cuddling our little boy to sleep to the beautiful Heartfelt photos that we had after he had passed, she cried, shaking her head at the unfairness of our loss as she looked at each one. I knew that lots of my girlfriends had wanted to come to Liam’s funeral so I apologised to Lisa for not inviting her, I’m not sure of the reason why we chose to have only close family at his funeral, but for us this is what seemed “right” to do. Lisa left and I looked at Ryan and told him that I wanted to clean our house. (It’s true what I said above that trivial things like washing didn’t bother me, but house cleaning is a different story for me!) Some would call me pedantic, but I have to have a clean house, every week I have this compulsion to clean our house from top to bottom, and if it is not done I can’t rest, even if I am bed bound and sick I still get up and clean, and I hadn’t cleaned the house in 2 weeks, although it didn’t look dirty, it felt dirty to me, so I set about cleaning the bathrooms, changing beds, cleaning the kitchen, the only thing that I asked Ryan to help with was doing the vacuuming, because I didn’t think that being only 9 days after my C section that vacuuming was a good idea. It was the first time that I felt slightly ‘normal’ it was normal for me to clean, it was normal for me to get my house in order, and although I thought only of Liam the whole time that I cleaned, I felt like I had achieved something after I had finished. It was about this time that I started to question my faith in God. (I am not going to pretend to be very theological and have all the answers, some that read this will be atheist, some will believe whole heartedly in God, and there will be other religions reading this saying that my beliefs are all wrong. I am not going to get into theological arguments with anyone, rather I will let you know where my thoughts took me) I remember standing in the shower that night screaming obscenities at God asking him why me, why my baby, what had I done to deserve this, I hated him, and told myself that there was no God, how could a God of love do this to someone, how could a God of love cause so much pain? For those that are atheist here’s my reason why I have no choice but to believe in God…As I was standing in the shower I realised that if I said there was no God, that I was saying that I would never see Liam again and for my sanity I have to believe that one day I will see Liam again, it is the only thing that keeps me going each day, to say there is no God means that I am saying that I will never see Liam again….and I can’t and won’t believe that, I believe with everything that I have that one day we will be reunited. I won’t say it has been an easy journey for me in this part of my life, because it has been far from it, but you will see my journey on this issue as I go along. That night was horrible, of a night it is silent, you try to sleep so you don’t talk and therefore you are left alone with your thoughts ‘Liam’s death is not my fault’ I’m not quite sure how many times I have had to say that to myself, as Ryan said in his account…the first job of a mum/dad is to protect their children, we had failed and by failing we both were left with huge guilt, and guilt eats away at you and consumes your every thought. I can’t recall all the days, we were still barely existing but I do remember that my mum and dad came over to see us the next Tuesday, we headed down to Dee Why to let Alethea scooter around, and it was freezing, so we headed into a café for some lunch. Still I had no conversation, I had nothing to say to anyone, I couldn’t yet do “small talk” as every thought that I had was consumed by Liam, he was my everything. I do remember mum and dad asking us what we planned to do the next day (Wednesday) as Alethea went to day care on Wednesdays and Fridays and we skirted around the issue like two naughty school children, neither of us wanted the parents to know that we were getting a tattoo, we didn’t want any condescending looks, and we didn’t want anyone trying to convince us not to get one. That afternoon we took Alethea to her normal swimming lessons, one of the lady’s at swimming had found out that we had lost our baby, and although Ryan wasn’t privy to it (he didn’t normally attend swimming lessons and didn’t know any of the lady’s) I watched as this one lady went from seat to seat telling all the other lady’s that we had lost our baby, and I saw them all looking at us. I pretended not to notice but it wasn’t a nice feeling. These were lady’s that I talked to each week, we weren’t on good friendship terms but we always had a chat, and do you know not one person came up to us, not one person told us they were sorry for our loss, not one person talked to us, I tried to make eye contact with a couple of them, but they avoided us altogether. It felt like we had done something horribly wrong, it felt like we were guilty of causing our baby to die, it felt lonely, it felt horrible. After dropping Alethea at day care that Wednesday we went to get our tattoos, Ryan went first, and Jimmy the guy doing the tattoo asked Ryan why he had decided on getting one, and Ryan told him what had happened, so when it was my turn poor Jimmy couldn’t even look at me, he pretended he was concentrating really hard and made no attempt to look at me or talk to me, as he didn’t want to upset me. 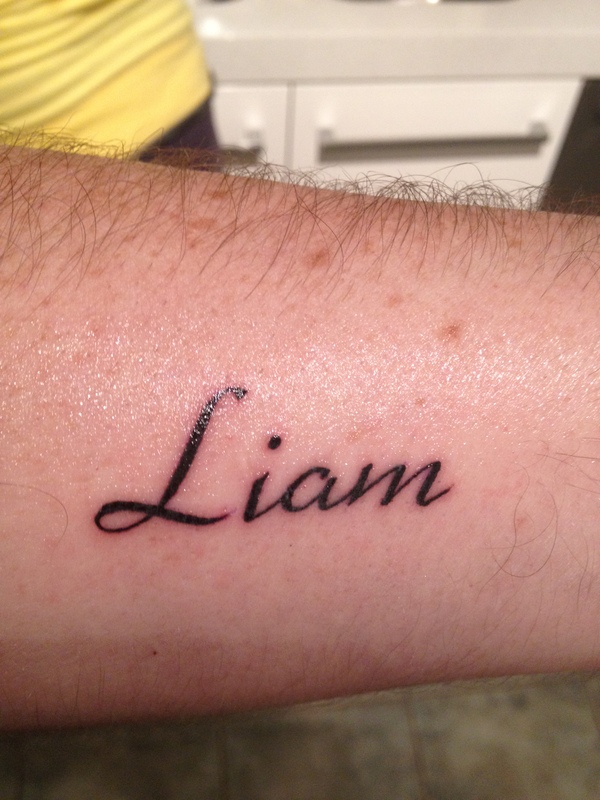 Ryan and I both got Liam’s name written on our left arm, this was the arm that we cradled Liam in and so this is where we wanted to look at his name and remember him. I think that both our tattoos are lovely, they are subtle enough that most of the time only we can see them, yet they are there forever imprinted on us. Mine is a white ink tattoo and Ryan’s is black, I will post them below; let me know what you think! Ryan’s tattoo, just after it had been done. Truth be told, I think I would have been one of the people to avoid me before this happened, now that I am on the other side I know how I will treat people grieving from now on! It can seem so tricky to know what to do in these situations, but reading your story helps those of us who haven’t been there so that hopefully we can realise better what might be meaningful and appropriate. My thoughts are with you all, I’m so sorry for your loss. Thanks for your courage in sharing your story with us. Hi Amanda, thank you for writing so beautifully. It is like you have written down my story also. I feel like we went through exactly the same with Angus as you did with Liam, from the funeral, and worrying that our babies will be cold, to dealing with friends, and swimming lessons where no-one says anything to you. I’m not a tattoo person either, but I had thought of getting one, and now after seeing yours which is so beautiful, maybe I’ll get one too. Thank you so much for sharing Liam’s story, it gives me and others comfort that we are not alone. Sending you a big hug. I think for anyone who hasn’t gone through what we have, wouldn’t understand how you can be so upset about our babies being cold, but it was something that I really struggled with, and at times I still do. 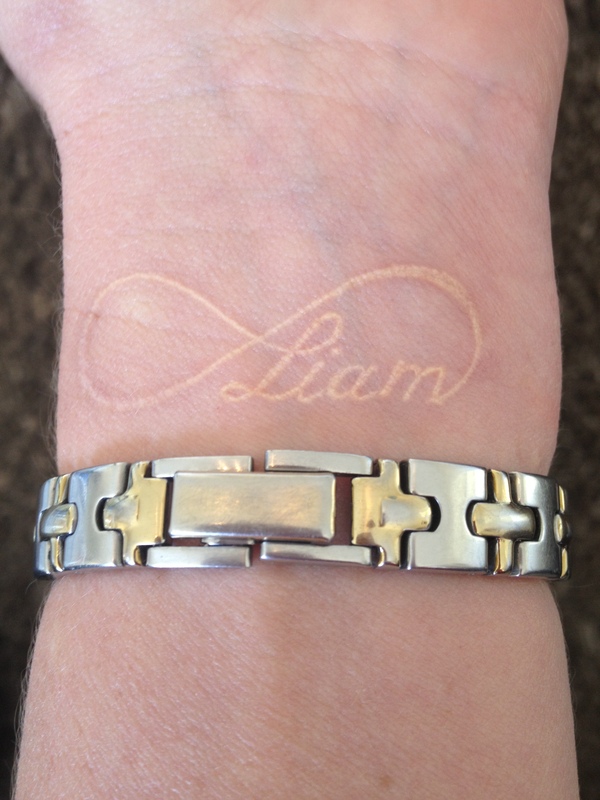 I totally support you getting a tattoo….I can totally tell that you are like me and are not a tattoo person, but do consider one, because I look at mine all the time, and these days I can smile when I look at it, it makes me feel closer to Liam, he is forever imprinted on me. HI, I came across this blog through my sister Jess Walsham. We have friends that lost twins in very similar circumstances to you and went through a very similar journey. Thanks for sharing it, it will help many people beyond just those you know. I was privileged to design a tattoo for the dad to celebrate the twins. It was challenging but rewarding to be asked to contribute in this way. The dad wears the tattoo with pride and love, I know you will too. Hi Martin, I think your sister was very brave reading our blog while she was pregnant, I did advise her that it probably wasn’t the best thing for her to read but still she read it…and I think that was very courageous. What a great privilege to design a tattoo for your friend, and yes you are right, I wear my tattoo with much pride and love, to begin with I use to be upset everytime I looked at it, but now I look at it and think of all the love that we had/have for Liam, I am so glad that we got one! I am so sorry that you have been through what we are going through. I think dealing with our children is one of the hardest parts about losing a baby, and what their little minds go through trying to understand the situation is heartbreaking, I think when Alethea realised that she couldn’t fly to the stars to see her brother that was the worst, because she finally realised the permanence of the situation, similar to your son with his fire engine ladder. I agree, please don’t ignore us, and please acknowledge our babies, they were real, much wanted and will always be loved and missed. We got ours done at Dee Why tattoo, they were really great there…highly recommend them! Thanks, they are very simple, but I really do love mine lots (I love Ryan’s too), I’m not sure how many times a day I look at it, but trust me it is lots!! Thanks, I haven’t seen one in ‘real’ life either before I got mine, a friend of mine put up a picture of a white ink tattoo on FB just after I had decided to get a tattoo, and I knew immediately that I wanted one very similar! Yes every child that we carry is precious, I think a lot of the time mums focus on the destination rather than the journey, (I too am guilty of this) although I was never “over” being pregnant as so many often state, I did want Liam to come, my words while I was pregnant were “I can’t wait to hold him safe in my arms” I’d like every pregnant mum to know that they need to enjoy being pregnant (no matter how bad the pregnancy is) because lots of people can’t even fall pregnant, and some that do end up like me. I too will be comforting grieving people in such a different way than I used to, I have learnt so much. It is lovely that you have said that we may have changed peoples lives. Thank you for sharing your story and I am so, so sorry for your loss. I haven’t experienced what you have but I am now more grateful than ever when I look at my daughter. 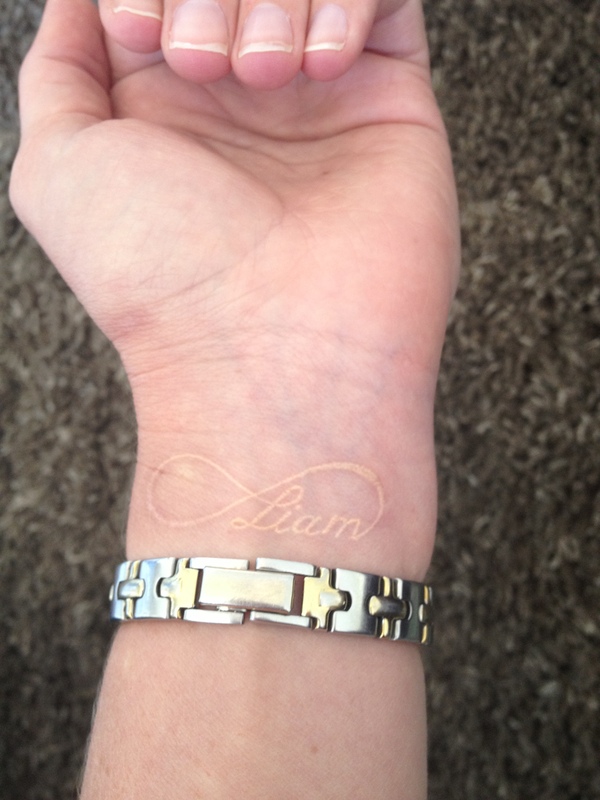 Your tattoo is honestly the most beautiful I’ve seen and such a lovely way to commemorate little Liam. I hope it gives you comfort in the months and years ahead. Both your tatoos are absolutely gorgeous, perfectly positioned and considering you arenot ” tatoo people” perfect sized. But hey, tatoos in memory of precious loved ones don’t mean any more or less no matter what size. Wherever we go or whatever we do they are with us in out thoughts and hearts…… A tatoo just seems to give us that appearance of them being here physically on our body ( even if only by their name) I loved your blog. I love you being so openly honest and writing exactly how you would speak it all if you were to stand up in front if a crowd and talk about your feelings about beautiful Liam. ( and Althea is a real cutie pie too) only a parent who has ever lost a child would be able to” get it” but for those who haven’t all they really can do is sympathize for us. And that’s not their fault but it still always leaves us with those thoughts ” why us” I truly beleive you doing all this is helping you to heal ( not ever fully mend) but your coping. And this is good because remember for as long as you shall live then beautiful Liam does too- not in the way you want I know but as much as possible. I apologize for the long comment , but when I write on this precious, tearing, smiling, devastating and life changing event I have so much to say……. As I’ve been there (a and am still there in many ways) myself. Love to you all and keep being YOU. Your a beautiful family of 4 whom I have an admiration for. Regards, Stacey. My dear friends who lost their 3 year old darter in July both have Lucy Emily tattoos on their left arms too. It is such a beautiful permenant reminder to yourself and to all others that this child was very precious. There will never ever be a day that goes by when you wish you had not gotten it and never a day that you will not see it and be reminded of the amazing son you have. Your tattoos are absolutely beautiful. I especially like the white ink. Me too, I haven’t yet seen another one in real life! I don’t normally like tattoos, but I think yours are truly beautiful!